All the tools are actual size. 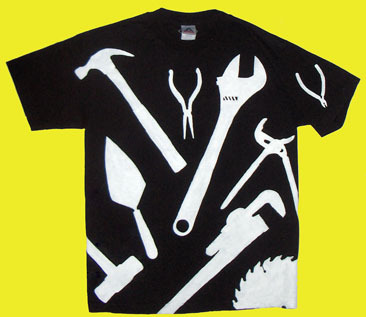 The nice people at Coe Lumber (3485 W. Broadway, Vancouver – (604) 731-6178) bemusedly allowed me to trace their tools onto vellum, and then I used white transfer paper (like carbon paper, but white) to transfer them to the shirt. Then it was merely a small matter of staying inside the lines. I wanted to make one for Tristan as well, but I wasn’t sure quite how to show his obsession: girls. I thought of painting silhouettes of girls’ arms embrassing him, with an abundance of kissmarks all over. I wasn’t sure, though, if it would be really really cool, really really embarassing, or both. Instead, I made a promisorry note for him, with some examples of what kinds of things I could do. 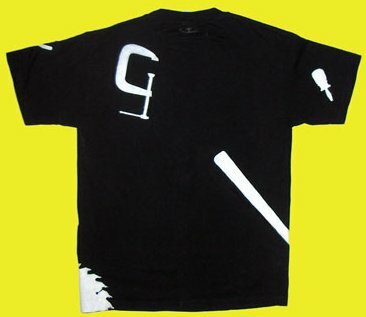 He was really taken with the idea of a tshirt that had a photo of a person printed on the chest, with filmstrip tracks (the things that look like ladders, that have holes for the sprockets of the film driver) on the sides of the photo, and cartoon versions of the photo below it. That tshirt will be really really cool — assuming I can pull it off — but will also take a ton of work. I’m hoping that I can have it done by next Christmas! Merilyn Simonds, a cool (and fun!) Canadian author who is living in my dorm, has been hosting “salons”. Every week, about ten or fifteen of us sit around in front of the fire and discuss something. Last week, Merilyn put forth that people believe fiction more than they believe non-fiction. She was channeling Janet Malcolm, who postulated that fiction is believed more wholeheartedly because a fictional world is the result of one person’s imagination. Malcolm supposes that because no other perspectives are possible except the one we are reading, we either fall for it or we don’t. When we read a nonfiction story, however, we know that there are undoubtedly many other perspectives, hence we suspend only part of our belief. I was startled, but think that it is true in a sense: people certainly do have a more visceral reaction to stories than to facts — even if the stories are fiction. You can quote statistics about a disease until you are blue in the face, but that doesn’t have the same impact as a story about someone living with that disease. Politicians know this. They trot out “real people” to convince the public of that the politician’s position is the right one. Companies know that. They make up compelling stories and feed them as advertisements to consumers. Even user interface designers know this: they make up fictional people and describe how they interact with the product. Why does this work? Why are stories so compelling? I wasn’t sure that I bought Janet Malcolm’s idea; when I get lost in text — fiction or non-fiction — I don’t think I really think about the existence of other points of view. I’m too busy reading. Well, yesterday, I happened across a Scientific American. It turns out that when you see somebody do an action, the same neurons fire as when you do that action yourself! Not only that, but the same neurons fire when you hear somebody perform an action with a distinctive sound (like ripping paper) as when you rip the paper yourself. I speculate that when we hear a story of someone performing an action, the same neurons fire as if we did the action ourselves, thus getting inside our head in a very literal way. It wouldn’t be a surprise that stories seem very real to us. It would feel a lot like we were there. I met Lennart’s loser friend. Wow! I’ve been nervous about the Mayan glyph. 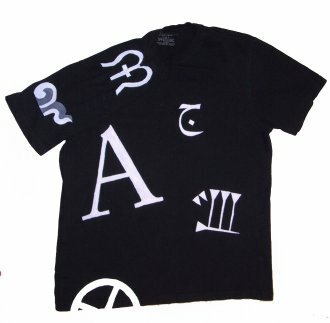 On both the tshirt and an earlier painting I did, I used the Mayan glyph for fire, which is handsome enough, but I was kind of bored with it. Also, it didn’t really feel representative of Mayan glyphs. Unfortunately, the glyphs that looked representative also looked hard. 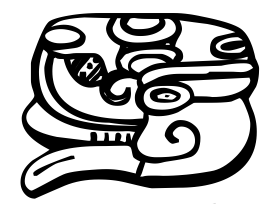 Mayan glyphs are very intricate, with lots of relatively thin lines. They are more like drawings than most writing systems. I had visions of all kinds of ways that I could screw up. I print the design on paper, then use carbon paper to transfer it to the jacket; if there are lumps (i.e. 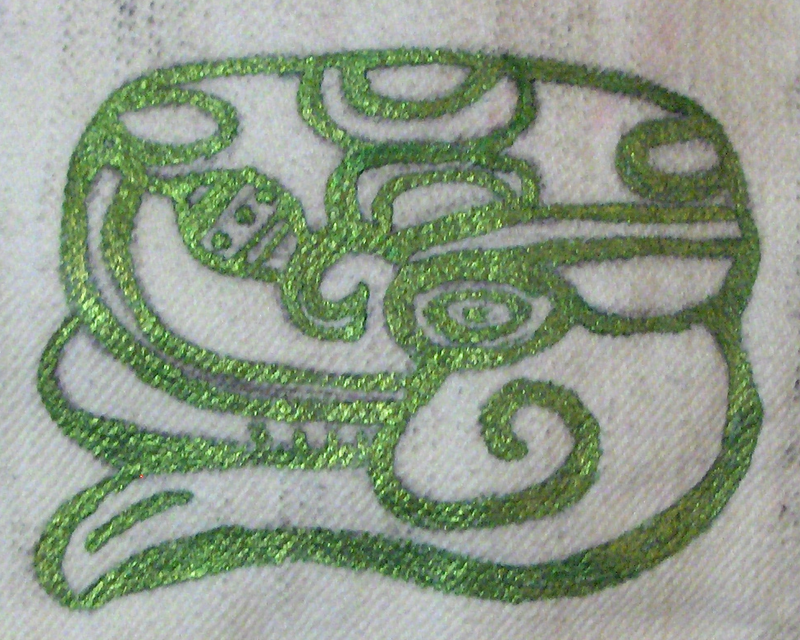 seams) then it gets hard to transfer the design cleanly, so I can’t always see where the lines are. If I don’t have good light and/or my eyes are tired, I can’t always see the lines well even when they are clean. If the paint is too thin, it is hard to keep it between the lines. If the paint is too thick, it spreads unevenly. If I don’t pay close attention, I lose track of what side of the line I’m supposed to paint on. If I’m tired or distracted, I am prone to wavering and/or dropping my paintbrush (aauuugh!). If I am concentrating too hard on glyph A, I sometimes put my fingers in the wet paint of glyph B. If people walk past heavily, or if I get startled, then all bets are off. Despite being excited about getting the Mayan glyph down (because it does look cool), it was with trepidation that I took my paints down to the Green College common kitchen, where I paint. And it worked! I did it! It came out beautifully! Now, I know that in the grand scheme of things, this is NOT a big deal. It isn’t going to save any starving children. But it was important to me precisely because it was scary, because I wasn’t sure I could pull it off. It’s like if you do well on an exam or manage to jump from a great height — it might not matter to the rest of the world that you got through it, but it might matter a lot to you. That’s how I feel right now, and boy am I chuffed! NB: I don’t actually know what the glyph represents. It was in a font made by Klaus Johansen. The picture above is of the front. It looks slightly odd because the shoulder is flattened so you can see the two glyphs on the top of the shoulder. Reading left-to-right, top to bottom, the shirt has Mayan, Dulkw’ahke (southwestern Canadian First Nations), Latin, Arabic, Cuneiform (Akkadian, IIRC). At the bottom is a symbol that might mean “sheep” in what might have been the precursor to writing. 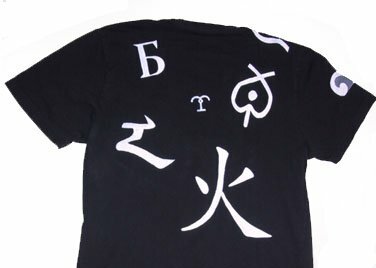 On the back, you can see Cyrillic, a tiny little Vai (Liberian) symbol, Telugu or Kannada (Indian scripts), Mongolian, and Chinese. NB: Updated on 15 Oct 2006, on request, to note the characters. If you are interested in writing systems, I highly recomment omniglot.com and ancientscripts.com.